The Load Area Impacts Machine Layout, Tooling, and Maintenance! Why does the location of the load area matter? The load area of a centrifugal feeder is the point at which parts stop being randomly oriented bulk and enter tooling features to achieve proper orientation for the process at hand. In most manufacturing and packaging settings, floor space is in high-demand so when laying out a manufacturing line, builders must consider the long-term effects of machine placement. They must consider ease of maintenance, safety, future changes to the line, and much more. Because not all features on a centrifugal feeder are symmetric, it is important to understand where tooling begins, where the discharge must be, and how operators will maintain the various parts of the feeder itself. In this module we show you how to move the load area so that the builder has the most linear distance to process (i.e. orient) parts with various tooling features while leaving enough room around the machine’s motors and gears to allow easy maintenance. 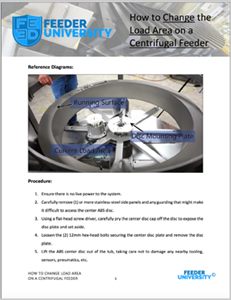 Read step-by-step instructions with diagrams included on how to change the load area on centrifugal feeder. Brought to you by Hoosier Feeder Company. Now I know how to change the load area, but how do I know I need to change it? 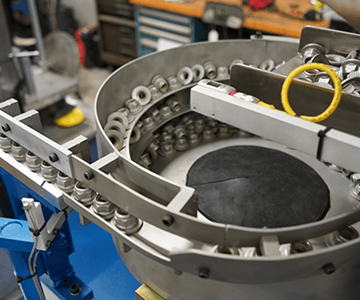 With so much to consider when beginning a centrifugal feeder build, it can be a bit overwhelming to make such an impactful decision before any real tooling begins. It always helps to use pencil and paper to sketch the layout of the feeder beforehand and try several load areas and machine orientations. More planning up-front typically means a smoother, easier build. Contact the experts whenever you’re unsure of the correct course of action, and for a complete solution look no further than the experts at Hoosier Feeder Company.